A young girl enjoys the company of her stuffed rabbit from sunup to sundown. This companion title to Ben Loves Bear (2013) follows a similar day-in-the-life format. In soft watercolor double-page spreads and smaller vignettes, Bella and Bunny do some gardening, enjoy a picnic and play the piano. McPhail uses simple, descriptive sentences to caption the art and includes bits of humor, such as Bunny’s enjoyment of a slice of carrot cake and Bella’s rough-and-tumble treatment of her friend. 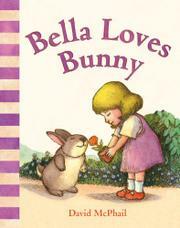 Probably due to issues of size and scale, some children may initially be confused as to whether Bunny is a stuffed animal or not, but Bella and Bunny’s warm relationship will draw them in regardless.